As you can see, the 1950’s theme continues. I’m enjoying it, even if you aren’t. It’s another Flowers recipe. Doubtless you can see where this is leading. Yes, I’ll be dragging you through the full Flowers range. So exciting. No idea whatsoever. About what GL stands for, before you ask. It’s some sort of Pale Ale, I know that. Leamington Spa Courier - Friday 21 August 1953, page 9. Looks like it was a posh bottled beer. Funny thing, that name. I always think of Websters when I hear Green Label. It was the name of the Light Mild back in the 1970’s. Though in adverts they usually forgot to mention it was a Mild. 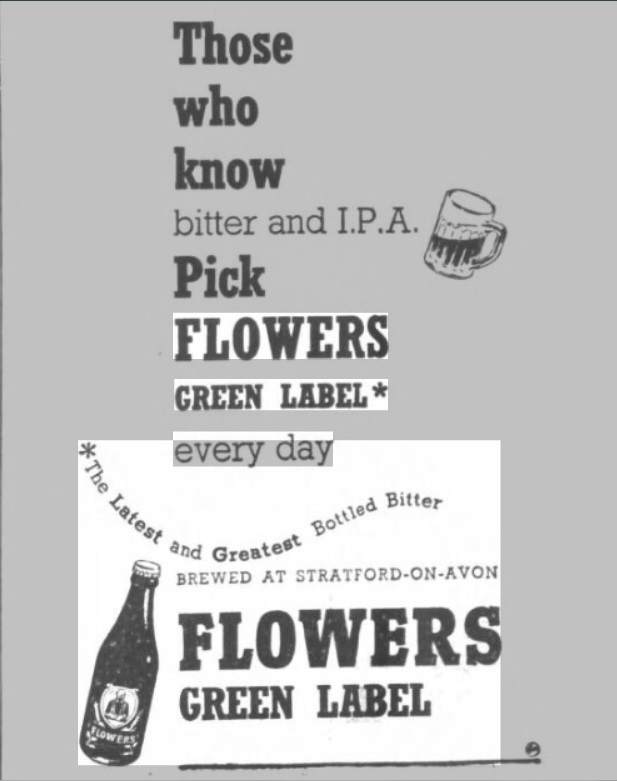 At an extraordinary general meeting of the shareholders in J. W Green, the brewers, held at Luton today, a large attendance unanimously approved the resolution dealing with the increase of capital, etc., in order to implement the amalgamation with Flower and Sons, of Stratford-on-Avon. Mr. Bernard Dixon, chairman J. W. Green, thanked the shareholders on behalf the board for the wholehearted support and approval which they had given to this matter. Yorkshire Post and Leeds Intelligencer - Thursday 25 March 1954, page 7. The combined company eventually fell prey to Whitbread. Who built a new keg brewery in Luton and close Flowers brewery in Stratford-upon-Avon. I think it’s time to get on with the beer itself. Continuing with the theme of their other beers, it has a very simple grist: pale malt, sugar with a touch of wheat malt and malt extract. Though there must be some colour adjustment going on as the colour is quite dark for a Bitter. If you want to go 100% authentic, you’ll need to add some caramel. The youngsters amongst you will doubtless be pleased to learn that Green Label was quite heavily hopped, coming in at over 40 IBUs, according to BeerSmith. With its relatively high FG and generous hopping, that must have been a very full, bitter beer. Looks quite interesting to me. Funnily enough, this is the one Flowers beer that wasn’t dropped. Though that could just be the particular example I have. That’s all I have to say, so over to me for the recipe . . . .